SfN 2016 was held in sunny San Diego / USA (Nov. 12 – 16) and attended by more than 30 000 people. That’s a lot of scientists to talk to about solutions for their research, funding in science, the future of Neuroscience, and of course the great atmosphere in San Diego. For this year’s edition of the meeting we decided to try out something new. 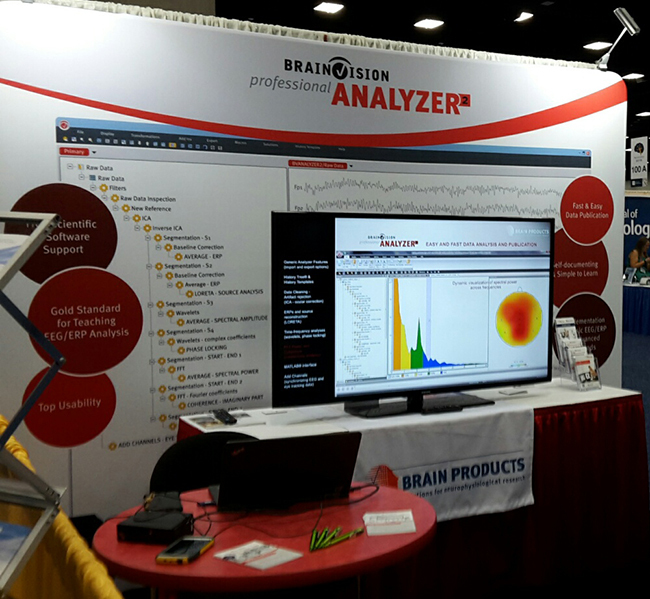 We dedicated a separate booth to our ever popular BrainVision Analyzer 2 software. On the one hand the additional booth gave us greater visibility in the huge exhibition hall. On the other hand, it allowed Analyzer 2 users to take advantage of individual “on-the-fly-workshops” and new users to get a thorough introduction to the software’s great features. Our booth staff, consisting of Scientific Consultants who are Analyzer 2 experts as well as the Analyzer 2 Product Manager, worked their magic at the constantly busy booth. Attendees asked and discussed their analysis questions with them and learned valuable tips and tricks around the software. Of course with more exposure, space, time and dedicated staff available on site comes also more opportunity to interact. So we are happy to report that more people than at any conference ever were able to experience our solution for efficient analysis of neurophysiological data and quick and easy publishing of results. The Analyzer 2 booth also gave us the opportunity to promote our current Analyzer Upgrade Special to those who are still working with Analyzer 1. While we officially stopped supporting Analyzer 1 on August 1st, 2011, all Analyzer 2 releases up until now still allow reading of Analyzer 1 workspaces and history files. For technical reasons this will no longer be the case once the next release of Analyzer 2 will become available (in spring 2017). 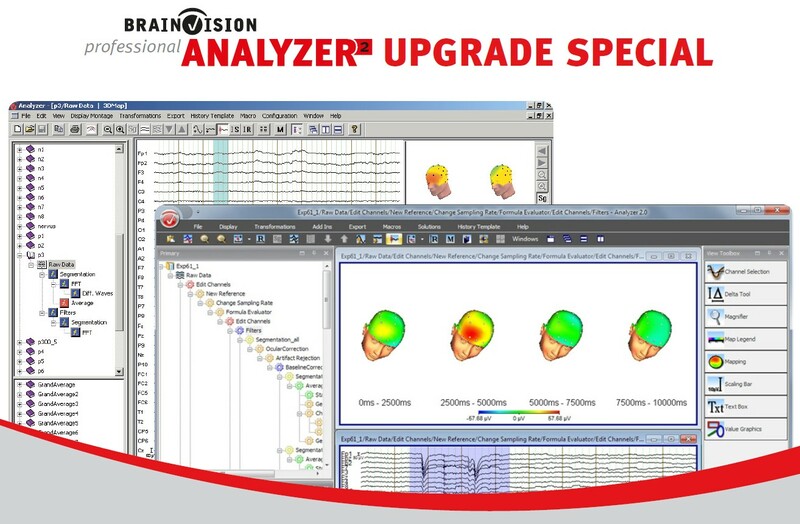 Therefore, we highly recommend you to upgrade your Analyzer 1 license now and taking advantage of our special promotion. For detailed information on this time limited offer and your individual quote, please contact your local distributor or us. 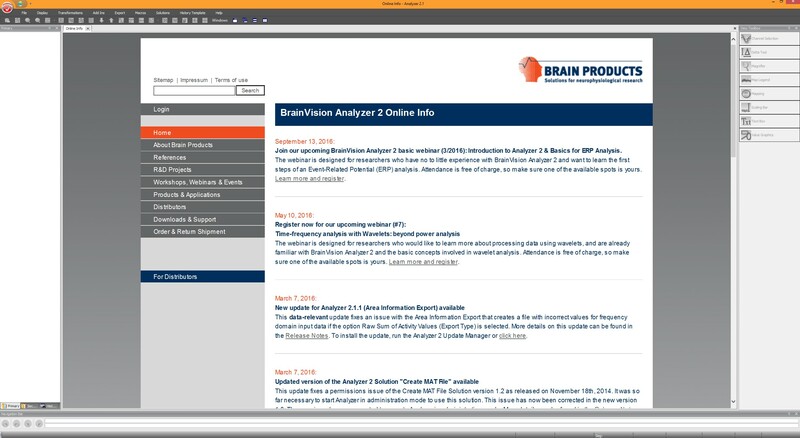 At SfN 2016 we also brought exciting news to the community in regards to Analyzer 2’s usage for teaching: The new scheme for Analyzer 2 educational licenses which is coming soon. This educational package will contain all essentials you need to teach Analyzer 2 at your workshop, summer school or similar events. It will consist of a network dongle with Analyzer 2 licenses for all attendees as well as general material like note pads, pens, badges, etc.. 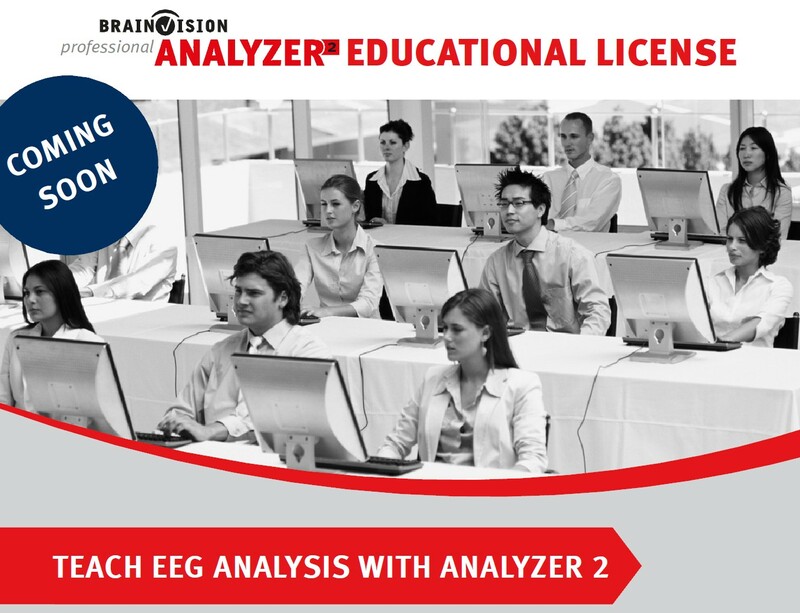 Hence, it will allow you to setup a full hands-on experience with Analyzer 2 for your students while training them on different methodologies, proper data analysis and scientifically valid processing of EEG data using the popular and well documented framework of Analyzer 2. Educational licenses will be granted to existing Analyzer 2 users upon request soon. Stay tuned … more details will shortly be published on our website as well as in the Analyzer 2 Online Info. Last but not least: With all the above mentioned news spread in San Diego, we’d like to remind you of the Analyzer 2 Online Info. This information page implemented in Analyzer 2. It contains the latest news about e.g. the release of software updates, new offers and promotions as well as dates for workshops and webinars. Analyzer 2’s factory settings make sure the Online Info is shown with any start of the software. However, the preferences can be adjusted in order to be informed only in case of important changes and announcements. To do so, go to “File → Configuration → Preferences → General”.